Celebrated local singer Otile Brown has revealed that he’s ready to have a child. The talented artiste seems to be hunting for a wife and a mother for his yet to be born children. Not so long ago, Otile Brown released a song talking about his relationship with the well-endowed socialite and even accused her of aborting his baby. WORDS BURN MY HEART, BUT THEY WILL NOT STOP ME FROM SPEAKING OUT. IF YOU HAD ALREADY KILLED ME, YOUR STATEMENT [ON OUR BREAKUP] WOULD HAVE BEEN THE OFFICIAL STORY. IT IS CLEAR YOU HATE ME, YET YOU KNOW VERY WELL WHY I LEFT. AND MY REASONS ARE VERY FUNDAMENTAL. MY BIGGEST PROBLEM WAS THAT MY THOUGHTS AND SUGGESTIONS WERE NOT RESPECTED. MAMA, I KNOW YOU, DON’T PRETEND LIKE YOU DID NOT KNOW WHAT THE ISSUE IS, YOU ABORTED MY CHILD. Vera Sidika came out to deny the claims that she had aborted Otile’s unborn child. Recently, she also revealed that she was planning to have a child with her new boyfriend before she turns 30. BAE SAID IT’S ABOUT TIME WE HAD A BABY. 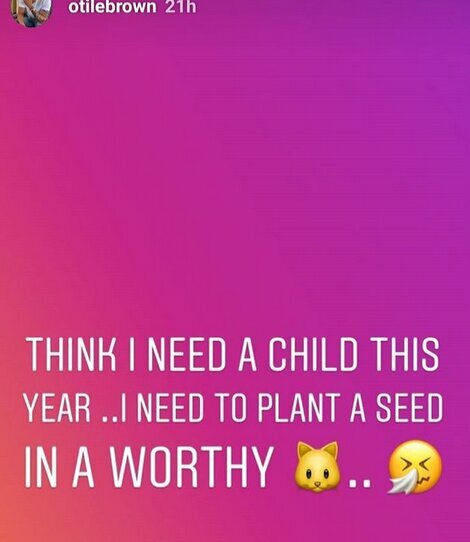 HONESTLY, I AGREE… WANNA GROW UP WITH MY CHILD. PLUS I’VE ALWAYS WANTED TO GET PREGNANT BEFORE I HIT 30.